Wolf Ridge Ski Resort is a family oriented resort located just 30 minutes north of Asheville, North Carolina. Nestled in the Blue Ridge Mountains of Western North Carolina, Wolf Ridge sits at 4,700 feet elevation and has 54 acres of ski terrain. We are North Carolina’s most accessible ski slope, located just 5 miles off I-26 West at Exit 3. Come “Ski the Wolf” and enjoy a crackling fire in our beautiful rustic lodge. Not Just for Ski Season – Want a great get-away destination for Spring, Summer or Fall? The Views is a great location for all seasons. Experience the re-birth of Spring first-hand as the trees and wildflowers bloom with fresh color, enjoy the cool mountain temperatures in the Summer and revel in the bright colors of the Fall foliage. And, from your mountain retreat, have easy access to all that the Blue Ridge has to offer – the Appalachian Trail, whitewater rafting on the Nolichucky and French Broad rivers, the Biltmore House, Blue Ridge Parkway, historic and unique Asheville and more! The Views Townhomes – Now Offered Through TurnKey Vacation Rentals – Three beautifully crafted, 3-story townhome buildings featuring 2400 to 3000 square feet of living space in each unit. These accommodations are perfect for groups of all sizes, from small families to larger groups. Each unit will sleep 12-14 people, with up to 50 in a single building. From hardwood floors in the living area to ceramic tile in the bathrooms and kitchen, granite counter tops, stone gas fireplace and much more, you will find yourself surrounded in luxury. You will also find The Views live up to their name with breathtaking views of the Blue Ridge Mountains. Smaller, motel-type accommodations are also available. During Ski Season our Stay and Ski Package offers the best value for your ski trip. Book your vacation rental then receive discounted lift tickets and rental equipment. Planning your ski vacation has never been easier. Wolf Mountain Realty offers dozens of cabins, mountain chalets and condominiums in Wolf Laurel Resort (adjacent to Wolf Ridge) for short-term or long-term rental. Whether you are looking for hot tubs and pool tables, long-range views or proximity to the Ski Lodge, let the experienced professionals at Wolf Mountin help you find your next mountain getaway. The following hotels are the closest to Wolf Ridge, each approximately 15 minutes away. 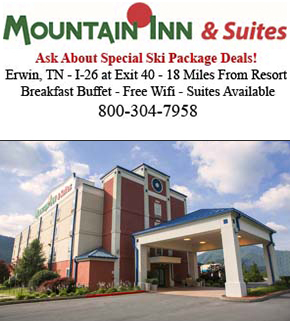 Be sure to ask about special rates for skiers.